Over a decade in development, Tantric Thelema develops author Sam Webster’s Pagan Dharma work uniting Pagan, especially Thelemic spirituality with Buddhist wisdom and ritual technology. 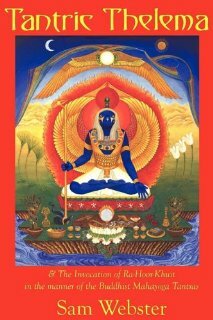 It gives a complete method for learning a Mahayoga Tantric technique for invoking the primary deity of Thelema, Ra-Hoor-Khuit. Forty-seven practices are described in fine detail with clear theory to enable the reader to advance spiritually. For the first time ever the Initiatory and Couples practices are published, along with a practice to prepare for Death. Sam Webster, M. Div., Mage, has taught magick publicly since 1984. He graduated from Starr King School for the Ministry at the Graduate Theological Union in Berkeley in 1993. He is an Adept of the Golden Dawn and a cofounder of the Chthonic-Ouranian Templar order, as well as an initiate of Wiccan, Buddhist, Hindu and Masonic traditions. His work has been published in a number of journals such as Green Egg, Reclaiming Quarterly, Mezlim, and Gnosis. He founded the Open Source Order of the Golden Dawn in 2001 (www.OSOGD.org), and serves the Pagan community principally as a priest of Hermes.